Spacious bungalow set in beautiful gardens on a small secure, gated community offering all modern conveniences including streamed TV with all BBC and ITV channels. Unlimited Wifi . Bluetooth stereo. The swimming pool is 25 metres from your private garden gate. Dine or sunbathe on your own garden terrace whilst enjoying the tranquility of the area. A 50 metre stroll takes you to the harbour where colourful fishing boats land their daily catch and the ferry can whisk you across to Fuerteventura in just 12 minutes. With a supermarket, banks and restaurants also just 50 metres from your door, you can nip out and be enjoying a delicious bottle of wine on your terrace within 5 minutes and probably all for less than a fiver. Being in such an excellent location also means you are within five minutes walk of both Playa Blanca beach and Flamingo beach - the choice is yours. The house is well equipped with all the essentials plus Tassimo coffee machine. The terrace has lounge furniture, table and chairs plus sunbeds. Suitability: The bungalow is situated on a quiet residential community well suited for families and couples alike. It is NOT suitable for individuals who like to make a lot of noise or hold late night parties! I love Playa Blanca! I first visited the island of Lanzarote in 1978 and have been back every year since. When I first stayed in Playa Blanca it was a tiny fishing village with one shop and three restaurants. Street lighting and pathways did not exist. Over the years I have seen PB grow with both the pros and cons but still love the area and visit at least 3 times a year. 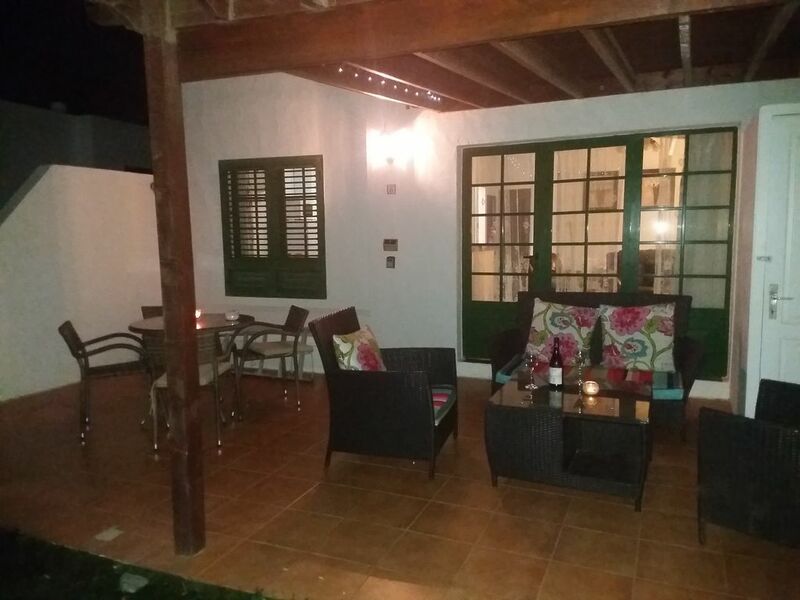 This was actually our second property purchase in Playa Blanca as so often friends wanted to come and stay and there was never enough room hence we bought Tres Hermanas (three sisters). We were looking for something centrally located and within walking distance to everything and this just fitted the bill! Yes it is a traditional old style Canarian house but that is why we like it. If you are looking for the ultra modern new build then sorry but you will have to go out of town and get a car! Location, location, location. Everything is within easy walking distance yet with complete peace and quiet. Both bedrooms are fitted with the latest whisper quiet units. Kitchen table and chairs . Outside table and chairs. Stereo for CDs and radio. Separate speaker with bluetooth connection. The bungalow is comfortably furnished with quality linens. All towels including pool towels are provided. A cot and high chair are available free of charge but you are required to bring your own cot bedding. Both bedrooms are of a very good size - No box rooms/bunks. Fitted wardrobes to both. Iron and board. The surrounding gardens are mature and well cared for making the community both attractive and tranquil. What a wonderful place to stay, sunshine from early morning to late evening, very tranquil vibe with fabulous neighbours in a safe and very friendly little community. A perfect week in a perfect spot. Therese has been really helpful and easy to deal with, it's been an absolute pleasure to have been able to spend time in her wonderful villa. THANK YOU! Lovely property, in good position and very comfortable. Particularly enjoyed outside space as weather excellent. Kitchen well equipped with plenty of working space. We hope to return with friends as plenty of room in villa. Thanks, Theresa. Enjoyed every minute, lovely apartment, everything you could want in accommodation. Even a dishwasher- marvellous, will definitely stay there again. Well situated for all the places we love to go to. Lovely villa. A real home from home. Very well equipped and furnished. It was spotlessly clean upon arrival complete with beautifully decorated Christmas tree. It was also a bonus to have heating available as it was quite chilly in the evenings! The patio furniture was also very comfortable with lovely cushions. We also enjoyed the sun loungers which appeared to be new. Thoroughly enjoyed our stay and have already booked again for May. Therese was a pleasure to deal with and even supplied a stamped addressed envelope to return keys. (Something that we haven’t had before). Would definitely recommend a holiday in this villa. Brilliant location and very relaxing. Great little Villa, everything you could need is supplied. Perfect for me and my partner, quite area, but so close to everything that Playa Blanca has to offer. The Villa is really nice, makes you feel like your at home, has everything you could need on holiday, and more. Great pool only a few yards from your front door. Would recommend this Villa very highly. Many thanks to the owner Therese. Playa Blanca is situated at the southern end of Lanzarote and enjoys its own micro climate being less windy and 2-3 degrees warmer than the north. Tres Hermanas has an excellent location just across from the port where many boat excursions are available including ferry and day trips to the island of Fuerteventura. A large well stocked supermarket is within 3 minutes walk of the house as are bars and restaurants. The beautiful safe beach of Playa Flamingo is approximately 5 minutes walk with its promenade lined with restaurants. A few minutes further away you will find the recently built waterpark ideal for youngsters. Prices based on up to 5 sharing. . Full payment due 30 days before arrival Discount for longer duration (3 weeks +). Please note: The online booking and payment service is designed for guests paying in GBP. If you would like to pay in euros please contact us directly for details.